Satellite pictures confirmed that atleast six Nasr Tactical missiles deployed in Gujranwala, Pakistan. Each Nasr can carry four missiles. The deployment consists of four launcher comprising twenty four missiles, ammunition bunkers and support systems. Gujranwala is 80km off from Indian borders, where Nasr's full range is 60 kilometers. The tactical missile deployment recently get operational status, after series of ground works completed to house those missiles. Recent upgrades in Google imagery unveiled the new constructions and operational deployment of those missiles. Since they were placed in the open field for an induction ceremony. Normally those launchers kept under fortified hangers. which keeps alive those missiles from airstrikes. The satellite pictures reveals two large hardened garages in the suspected area. which can keep three launchers in one garage. both of them interconnected each other and the ammunition bunkers situated few meters away from the launch pad. The base still in expansion, suggests new constructions and launch pads inside the compound. the main launch area has two launch pads. while another area had five launch pads connected with five separate garages. Each of those garages can accommodate two Nasr batteries. Satellite pictures also clearly shows Tyre marks between the launch pad and garage shows regular exercises has been happening in the base. Another complex in the same compound looks like base administration buildings, buildings for troop accommodation, command and control centers. Which gives quick access to the crew to reach the launch pads and garage area. Nasr is considered as a nuclear missile, used to counter the Indian cold start doctrine, The doctrine explains quick mobilization of massive Indian army close to the International border, further step inside Pakistan. 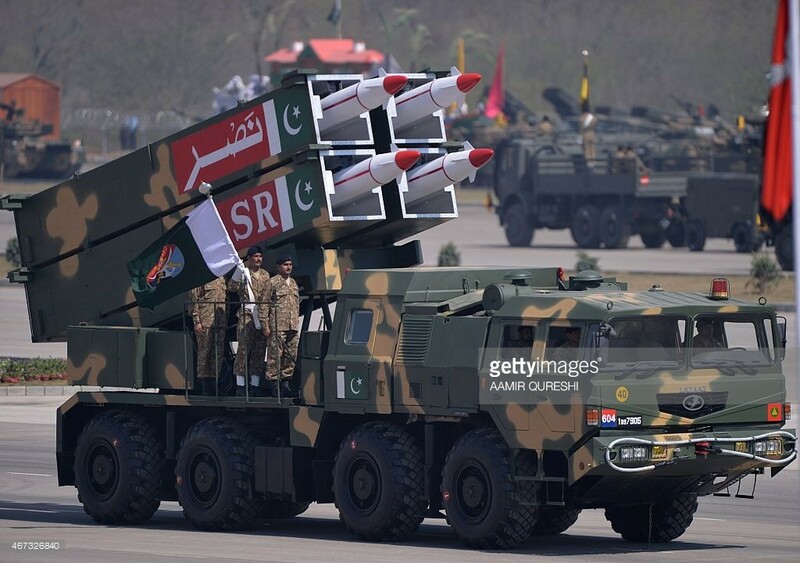 Pakistan uses the Nasr missile for reliability since it's shorter range that means sixty kilometers. Nasr is single stage missile, and carries upto five kilotons of nuclear warhead. The above information are good enough to prove that Pakistan must use the nuclear missiles. in case of any border conflict with Pakistan. Those missiles can be used, if Indian soldiers march inside Pakistan. Those missiles are well close to Indian cities that means hundred kilometer from Jammu and 80 kilometers from Amritsar. India have better option to counter the Pakistani tactical nuclear threats.To counter the Nasr launch IAF should conduct a preemptive air strike on those location. Since the deployed area is small and can be marked using GPS/LGB guided bombs. IAF need bunker busting bombs to destroy those launchers. Since they were kept under hardened concrete shelters. Normal High Explosive heavy bombs will not penetrate such shelters. IAF may use the Jaguar fighters from Amritsar Air force base. IAF already had few Bunker busting LGB's bought from US major Lockheed Martin. Some reports mentions IAF bough one hundred bunker busting GBU 28 Paveway III LBG bombs. However there is no details available about additional procurement. It's believed, few of the home made Sudharshan LGB's also had penetration capability to strike hardened shelters. By assessment IAF need more than twenty five Jaguar bomber each armed with three LGB's to destroy the key infrastructure in the Gujranwala Tactical deployment base. Below is the Google map of Gujranwala Tactical deployment base.